This blog post delves a bit deeper into the field of Sport for Peace and Development (SPD), and describes a “Spectrum” and “Typology” which are useful to understand different types of SPD activities, and the clear positioning within them of the Sport For Peace activities implemented by Generations For Peace (GFP) volunteers. The field of SPD has grown substantially at a global level over the past dozen years. United National General Assembly Resolutions 58/5 in 2003, and 65/4 in 2010, entitled “Sport as a Means to Promote Education, Health, Development and Peace”; the establishment in 2014 of an “International Day of Sport for Development and Peace” on 6 April; and the International Olympic Committee’s recent (2015) position paper on “The Contribution of Sport to the Sustainable Development Goals and the post-2015 Development Agenda”[ii] indicate the formal recognition of the field. Located conceptually within broader “global civil society” it is a highly contested policy field that features diverse political actors and ideologies[iii]. There are various formulations of the field, including “development through sport” (DTS), “sport for development” (SFD / S4D), “sport for development and peace” (SDP), and “sport for peace and development” (SPD). 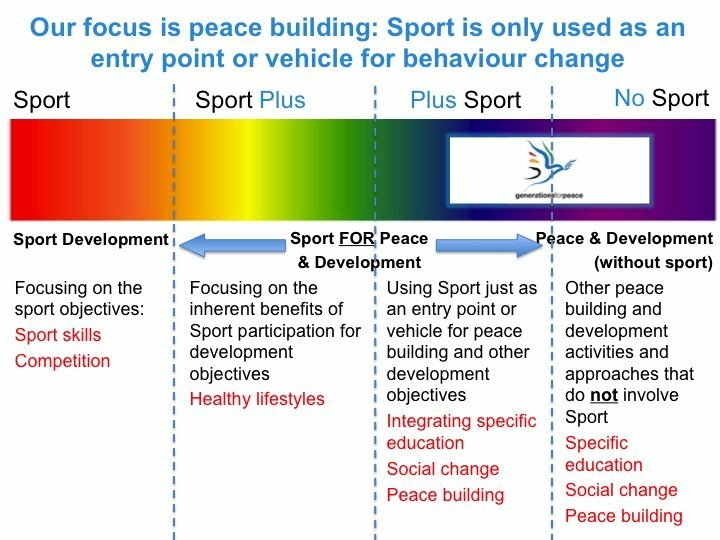 Given GFP’s focus on sport for peace interventions, where peace building and conflict transformation are the primary objectives (and following the terminology of the joint International Olympic Committee/United Nations Forum on “Sport for Peace and Development”), GFP refers to the field as “SPD”, and within that field refers to sport for peace as “SFP”. The SPD field is complex and variegated, and covers a broad spectrum of diverse activities. The field is not directly concerned with sport development or the development of sport itself and its objectives are not sport objectives such as sports skills or competition. Rather, the field spans a spectrum of activities, positioned between sport development on one side, and other peace and development activities (not utilising sport) on the other side. On the far left of the spectrum, sport organisations are focused on “Sport Development”, developing sporting skills, competitions, etc. The SPD field spans the two central sections of the spectrum: “Sport Plus” and “Plus Sport”[v]. “Sport Plus” types of activities are primarily focused on the inherent benefits of sport participation for development objectives (such as healthy lifestyles). If you were observing a Sport Plus activity it may look exactly the same as a Sport Development activity, but the objectives would be for a different development aim, rather than purely for development of sport. “Plus Sport” types of activities are primarily focused on a specific development objective, and the sport element is used as the entry point to gain access to a target group, and sometimes also as a vehicle for other behaviour change or educational interventions. If you were observing a “Plus Sport” activity it may not look like any recognised sport code: it may involve some sort of adapted field of play, some sport equipment and teams running around, but the activities are more specifically designed for an educational or behaviour-change objective, and would also include some sort of peer group discussion. In “Plus Sport” interventions, it is not sport activity itself that brings about change, instead it is the set of processes and relationships used to deliver and support the sporting intervention, and other activities that are integrated into the sport situation, that are fundamental to achieving the desired development goals. GFP’s sport-based approaches for peace building and conflict transformation are positioned at the “Plus Sport” end of the spectrum. GFP volunteers also implement non-sport programmes using arts, advocacy, dialogue and empowerment activities for conflict transformation, so the GFP therefore spans the “Plus Sport” and the “No Sport” parts of the spectrum. The “technical model” overlaps partly with externalist, colonial strategies for problem-solving, and finds favour among pragmatic transnational corporations and other pro-market organisations. The “dialogical model” overlaps with the early post-colonial strategy of ‘independent’ modernization, and fits with more embedded intergovernmental and networking nongovernmental organisations. 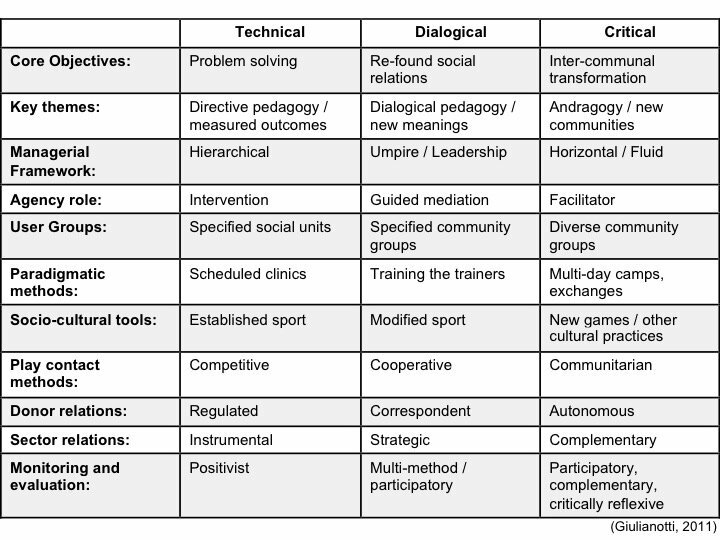 And the “critical model” links to the self-governing, self-empowering strategies of the advanced “development through sport” method, and is particularly evident among small-scale, innovative nongovernmental and community-based organisations. GFP’s Sport For Peace approach is positioned primarily in the “critical model” supporting community empowerment, autonomy, and transformation through self-directed practices responding to local context and local priorities, and participatory processes of evaluation, learning and reflection to ensure local ownership. Giulianotti notes most SFP programmes will feature different mixtures of these ideal-type models, and that “Inevitably, variations arise between any phenomenon’s ideal-typical construction and its actual manifestation. However, these differences enhance, rather than vitiate, the sociological insights to be gleaned, not least by enabling more ‘subtle sociological distinctions’ to be drawn between abstractions and empirical findings, or between the ideal types themselves.”[vii] It is of great value therefore, for GFP volunteers to be aware at each step of whether they are truly operating according to the values and practices of the “critical model” or have strayed towards the “dialogical” or “technical” model. Want to learn more about our work? Subscribe to our newsletter to get the latest updates, or check out our latest videos with stories from the field. [iii] Giulianotti, R. (2011) “Sport, peacemaking and conflict resolution: a contextual analysis and modeling of the sport, development and peace sector.” Ethnic and Racial Studies 34:2, 207-228. [iv] Clark, M. (2012) “Demystifying theory and remystifying practice: Theoretical frames for better practice of sport-based approaches to conflict transformation.” HEC Paris and University of Oxford CCC programme. [v] Swiss Agency for Development and Cooperation (2005) “Sport For Development and Peace”. Swiss Agency for Development and Cooperation. [vi] Theokas, C., Danish, S., Hodge, K., Heke, H., and Forneris, T. (2008) “Enhancing life skills through sport for children and youth”, in “Positive Youth Development Through Sport”. Routledge. [vii] Giulianotti (2011), referring to Weber, M. (1978) “Selections in Translation”. Cambridge University Press. (1978, p23-4).